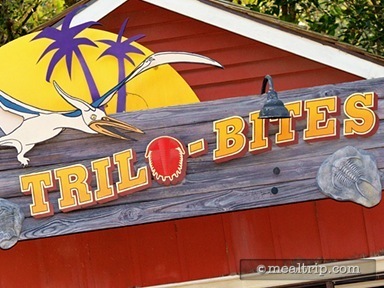 The Trilo-Bites kiosk is located just before the entrance to Dinoland USA, and offers a menu that changes frequently. This had been "the" Turkey Leg location at Animal Kingdom, but now seems to focus on house-made waffles... plus. That "plus" might be ice cream (i.e. a Waffle Sundae), or it might be chicken... as in, the Buffalo Chicken Waffle Slider. Because there's usually ice cream and sodas available in the kiosk... various "floats" are usually on the menu as well. We have noticed that recently, a few craft beers have shown up... but have yet to ask for a "beer float". Trilo-Bites has always seemed a little out of place to me. After crossing the bridge that connects Discovery Island and DinoLand USA, I'm not really thinking "I wonder if there's anything to eat around here". Instead, for just a brief second, I feel completely lost and directionless. 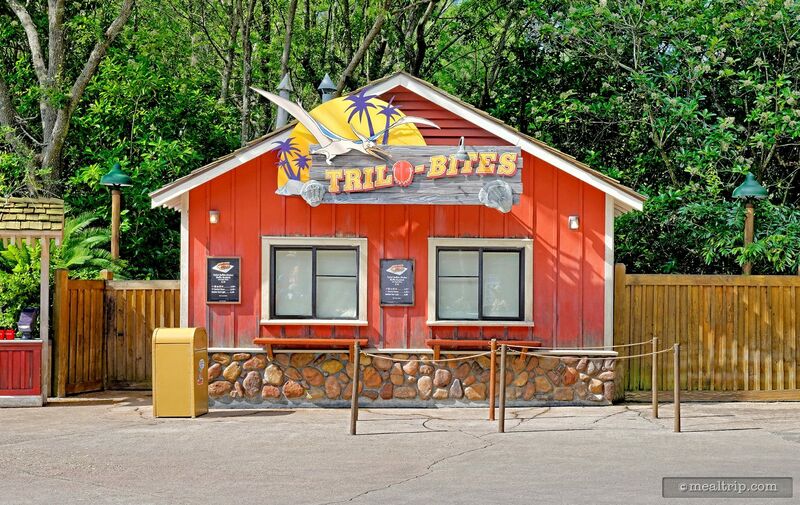 I think it's because Trilo-Bites is one of those rare locations in a Disney Park where you can't really see your next themed area. DinoLand seems close, but you're not quite there yet. Discovery Island's Flame Tree BBQ, the giant Tree of Life, and "A Bugs Life" seem like they're a mile away... and no one is really sure why you would head down that other road. Someone said Finding Nemo was down that way but I don't know... it sort of looks more like the path that Little Red Riding Hood got accosted on her way to grandmother's house. I have taken it upon myself to rename this area LimboLand, now home to Trilo-Bites, an odd little gift cart kiosk hybrid, a couple of wooden benches, and some birds... always with the birds. 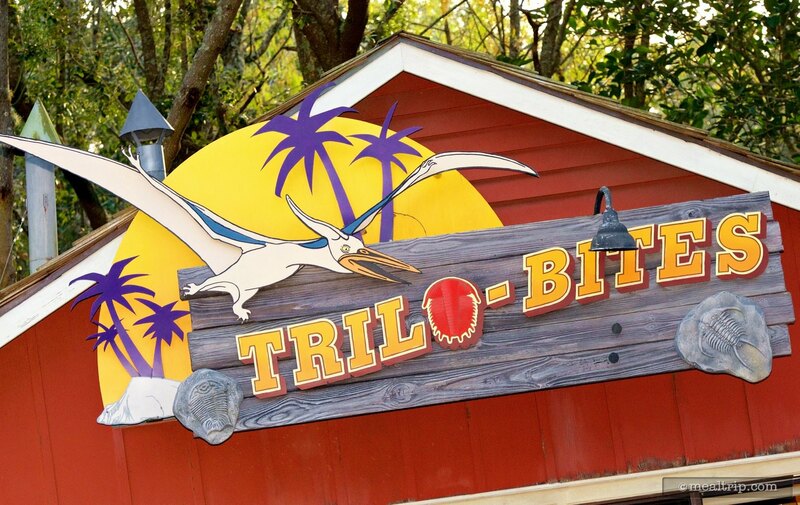 So, on a recent walk and pause in LimboLand, I looked over at the Trilo-Bites menu board and noticed what would end up being a great (new to me) snack and/or meal, depending on how long you're planning to spend in LimboLand. 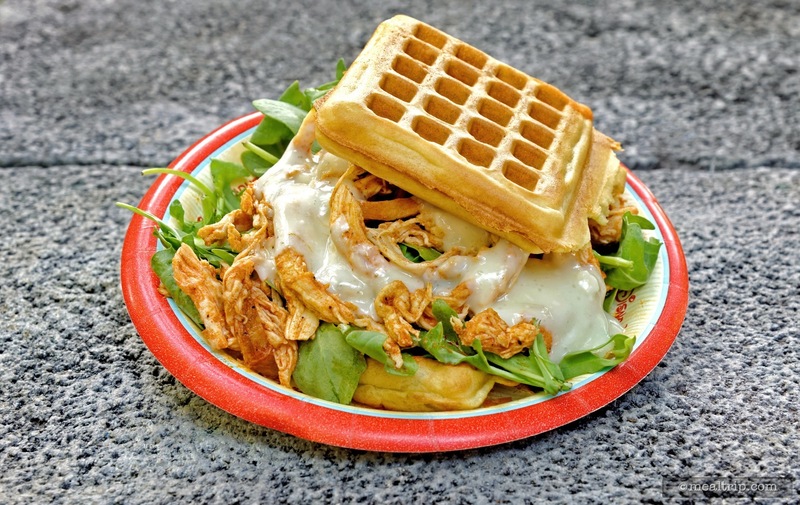 The open faced Buffalo Chicken Waffle Slider with Blue Cheese and Arugula is on the menu as a "Disney Dining Credit Snack Eligible Item", but for me (and with the addition of a beer), it's plenty big enough to be a meal. I'm always on the lookout for well spiced and seasoned items. At theme parks, they tend to be very mild in order to appeal to a large number of guests. I'm happy to report that this Buffalo Chicken had a bit of kick to it. Most die-hard Buffalo fans would probably call it "mild", but the amount of slow heat here would be just enough to turn away some of the more timid palates. The blue cheese treatment here was more in the form of a liquid dressing with a few crumbles of blue cheese here and there, which worked out well, because the pulled chicken itself was not swimming in buffalo sauce. That's not to say it was dry though. The chicken itself acted more like a proper juicy barbecued meat that had been brushed with buffalo sauce. The arugula added a nice, fresh, herby crispness to the mix while trying to provide a barrier between the chicken, the blue cheese dressing, and the waffle. There was however, no saving the waffle on the bottom. While the top waffle stayed hot and crispy, the bottom waffle really soaked up everything. The term "slider" here is supposed to imply that you can pick the whole item up sandwich style, but this was a knife and fork plate to be sure. For those that question the use of a "waffle"... it's a southern thing. The waffle itself is not super sweet. There's no maple syrup or any other breakfast items involved. 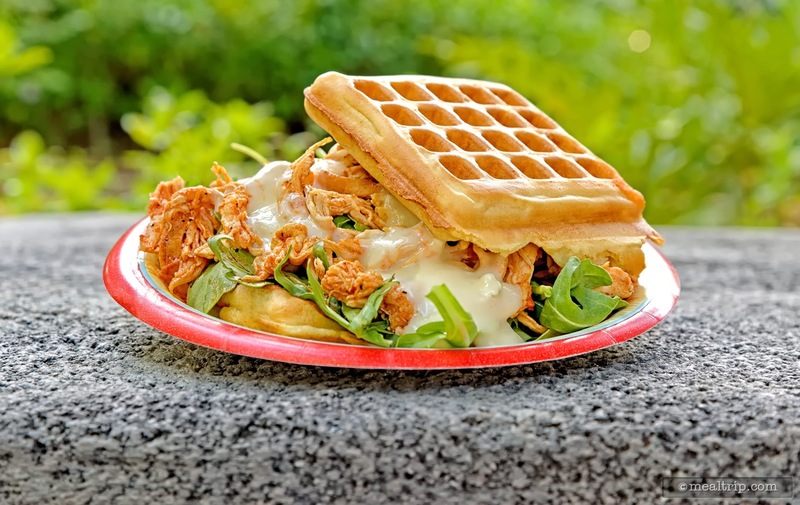 There's just a bit of sweetness that you'll get from the waffle, that actually provides a nice separation from the tangy blue cheese and spicy buffalo chicken. As far as "why"... buns it seems... take up quite a bit of space. You have to rack them up, because nobody wants a squished bun. In a small location where space is a premium, bun storage is a big concern. You can make a ton of fresh, hot waffles from five gallons of batter, which in liquid form, takes up almost no space at all. The upside is, you get a fresh, just made bread-like product that's crispy and soft and hot. The downside is, it does take about two and a half minutes to make a waffle. You can't really make a ton of waffles ahead of time and store them because they pick up moisture very quickly. Each of the kiosk and booth locations that offer waffles in the parks, seem to have at least three waffle makers on hand... but lines can still get backed up at peak times because they're making these little gems right there as you order them. At $5.50-ish… I feel like I found a real bargain (in Disney dollars-speak), there was a lot of great food on the plate… and a larger "snack" than I'm used to having. Of course adding that beer will bring it right back up to that $12-$15 range, which is where most all counter service locations in the park are at price-wise. The Buffalo Chicken Waffle Slider at Trilo-Bites may well be "the" main attraction in LimboLand at the moment… and that's a good thing, because now I won't feel so lost when I arrive at that particular crossroad. LimboLand at Animal Kingdom, it's where the Buffalo Chicken Waffle and beer are!